Radiate elegance with the rich, textured blue dial shimmering with Swarovski® crystals, plated mesh bracelet and gold-tone details. The ultra-thin watch case offers a touch of simplicity and sophistication to your day-to-night look. 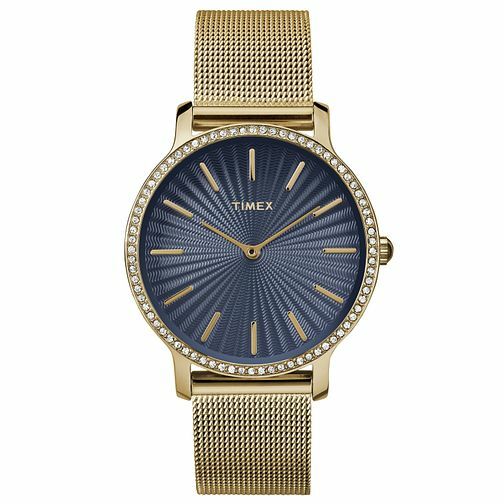 Timex Ladies' Slim Starlight Gold Tone Mesh Bracelet Watch is rated 4.0 out of 5 by 1. Rated 4 out of 5 by Anonymous from Lovely Watch The watch is exactly what I expected it to be. I bought it as Christmas present for my gran and needless to say, she loves it.